A new partnership between Microsoft, Tobii Dynavox and Boardmaker introduces Picture Communication Symbols (PCS) to Microsoft’s Learning Tools. 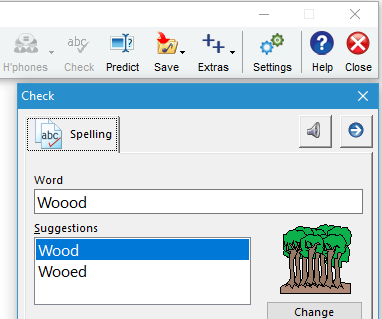 Symbol and picture support is nothing new to the world of literacy support software as it has been available in Texthelp’s Read&Write via the Picture Dictionary and Vocabulary tools, and ClaroRead’s Spell Check for many years. Do I need to pay for Picture Dictionary? What is Microsoft's Immersive Reader? Immersive Reader is part of Microsoft's Learning Tools, and is designed to improve reading support for people with literacy difficulties such as dyslexia. 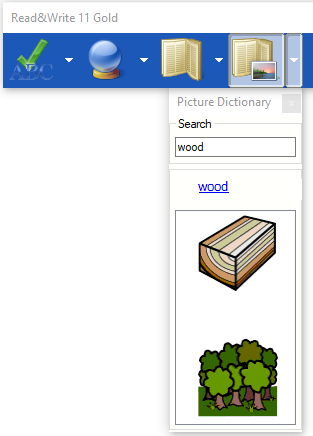 Picture Dictionary is the latest addition to Learning Tools. 6 different background colour and font themes. Options to change text size from 14 to 96 point with an easy to use slider bar. Parts of Speech - nouns, verbs and adjectives can be customised or highlighted with different colours. Line focus - helps to reduce clutter and aid concentration. Picture Dictionary is turned off as a default setting. To turn it on, make sure you are in 'Edit' mode then select the ‘View’ tab and choose ‘Immersive Reader’ – see the illustration below. In Outlook Online Immersive Reader is located under ‘More Actions’ (3 dots on the far-right side). When you select the Immersive Reader icon, Word Online (or OneNote / Outlook) will load a new page with tools appearing on the right side of the screen. Select the 'Reading Preferences' icon and when the window appears, slide or tap the Picture Dictionary button to On. Type some text and click or tap on individual words to see their symbol representation(s). Not all words have an associated symbol but they do have audio, so you can hear each word spoken aloud. Tapping on a word to see an associated symbol works particularly well on the Microsoft Word and OneNote app for iPad. You can also tap or click the speaker icon to hear the selected word spoken aloud. Picture Dictionary can also be used in combination with Line Focus. 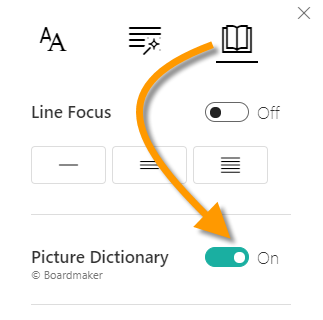 Line Focus helps you to concentrate on one line at a time (3 or more lines are also available) thereby eliminating potential distractions that are on a page. Line Focus can also help with visual stress difficulties. The colour of the background and line focus can be changed in the Text tool and offers a range of ways to personalise the reading experience. Combined with the text to speech tool, Immersive Learning tools are a great step forward in providing inclusive digital learning tools in existing programs that are used on a daily basis in schools, colleges and universities. NB The symbols can only be used to support reading of individual words as they cannot be embedded in the text. Immersive reader cannot therefore be used as a method to print symbol-supported materials for use in the classroom.